January 24, 2019 – Dry weather with locally breezy northerly winds expected through the end of next week. Daytime high temperatures a few degrees above normal. High amplitude upper level ridge over the eastern Pacific and west coast will keep the forecast dry and dominate the weather pattern through the short term period. Northerly surface gradient combined with northerly flow around the upper ridge bringing light northerly winds to the northern Sacramento valley this morning and this is keeping fog from forming in this area. Farther south, lighter surface gradient and therefore lighter winds southern Sacramento and northern San Joaquin valleys allowing for some areas of fog there. Overall airmass warms today under building ridge and early morning temperatures a little above 24 hours ago. Today’s highs will climb a few degrees over yesterday or about 5 to 10 degrees above normal for this time of year. Upper ridge axis pushes towards to coast on Friday bringing a little more warming and lighter north winds. Drying airmass should keep valley fog at a minimum. Upper ridge axis continues to move inland over the weekend centering over the west coast on Saturday. 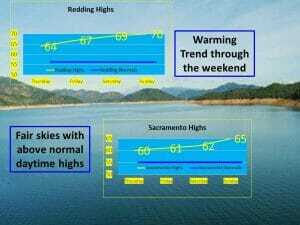 This will bring the warmest temperatures of the week over the weekend with daytime highs expected to reach from 10 to 15 degrees above normal. Mid-level ridging over California continues Monday through Thursday keeping conditions dry. An enhanced pressure gradient across the Sierra may lead to some gusty north and east winds Monday into Tuesday. Next week high temperatures remain in the 60s in the valley and the upper 40s and 50s at higher elevations. There may be a chance of the ridge breaking down by next weekend, but model disagreement is still high at this point so confidence is low for any precipitation chances.